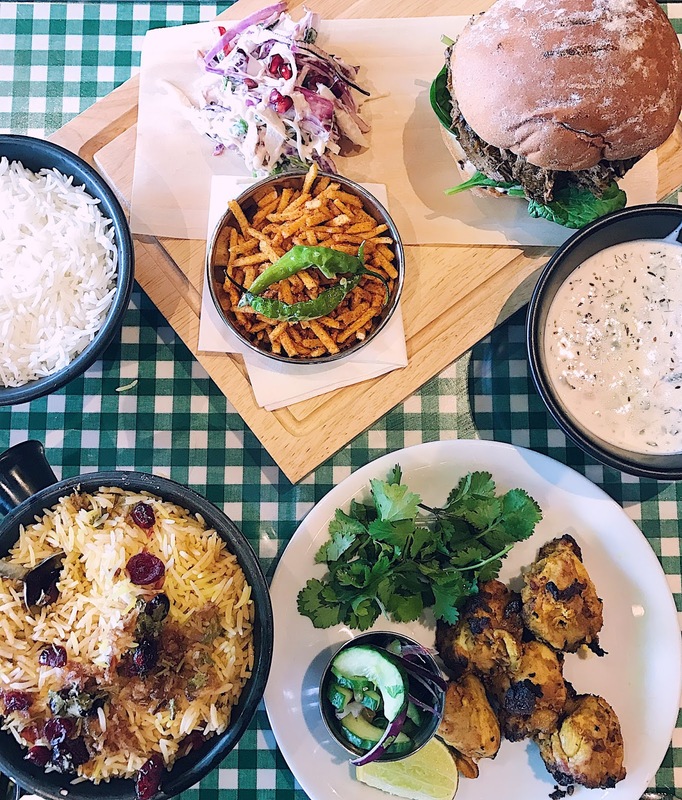 I have been wanting to go to Dishoom ever since I heard about it opening in Edinburgh at the end of last year. I love Indian cuisine and the concept of an Irani, 20th century Bombay café really appealed to me. 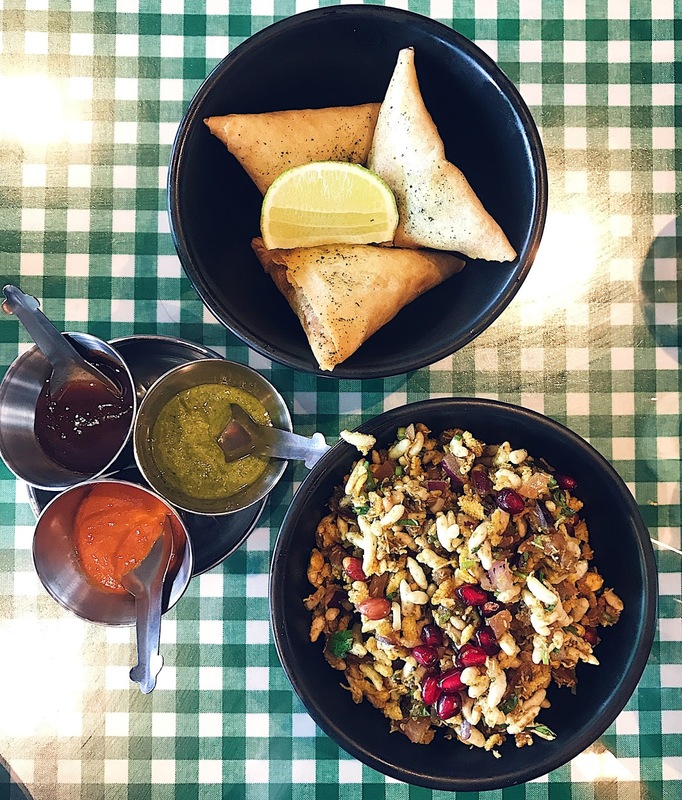 Rather than your classic Indian restaurants where you would order a curry and rice, Dishoom serves small plates of tapas style dishes, only two of which are actually curries. You can have a look at the menu here but to be honest I found it a bit complicated and it was much easier asking the waitress to explain it all. If you click on the link, you will also notice that there is a breakfast menu! I am yet to try an Indian breakfast but it sounds really interesting, serving things like sausage or bacon Naan rolls, Irani spiced scrambled egg and tomato, onion coriander and chilli omelettes. Food is served here until 11pm from Sunday to Wednesday and until midnight on Thursday, Friday and Saturday's and their beautiful little bar, the Permit Room, is open until 3am. As Bombay cocktails are my new favourite thing, I will definitely be taking advantage of this late night bar and its chilled atmosphere. They also offer take-away but it is only available from breakfast until 5pm weekdays, perfect for a working breakfast or lunch. The restaurant itself takes you right back to the mid-1900's, giving you a real feel for what the Bombay café's were like. The atmosphere that the restaurant has achieved is amazing, from the decor to the music to the smell of the incense burners, it takes you to another world. I also love how there is a story behind everything, a reason for every decision. For example, the Permit Room (the bar) is named after the Bombay Prohibition Act of 1949, where there is a requirement to have a permit in order to drink alcohol. Lamb Samosas - crisp and flavoursome, they go really well with the lime and coriander dip that was put on the table. Dishoom Chicken Tikka - Served on its own (just with a bit of coriander/cucumber). Really tasty and succulent, the chicken just fell apart, it was cooked perfectly and had quite a kick to it. Raita - delicious, cooling yoghurt dip with coriander, cucumber, red onion and other wonderful flavours. This was suggested by the waitress and I was sceptical at first because I'm not the biggest fan of yoghurt but it was so flavoursome and it went really well with everything that we ordered. Chicken Berry Britannia - slow-cooked chicken, layered with aromatic rice and cranberries. This dish didn't quite pack a punch like the other dishes but still had some lovely aromatic flavours and the chicken was really tender. Bhel - crunchy Bombay mix with rice puffs, pomegranate, tomato, onion, lime, tamarind and mint - served cold. Again, so many flavours and just so tasty. Lamb Raan Bun - slow-cooked pulled lamb in a soft roll with pomegranate coleslaw and sali crisp-chips. The lamb itself was delicious and there was plenty of it. It was so juicy and really well flavoured. The coleslaw was also really nice. The roll was huge and the crisps were just really salty so we didn't eat either of them however the menu did warn that it was a 'feast for one' so it was our own fault for ordering too much! Overall we really enjoyed the food at Dishoom (and the cocktails!). Everything was so flavourful and it really felt like we were eating authentic Indian food. The service was quick and all of the staff were really friendly and helpful. Considering it was pretty much full when we went at 4pm on a Monday, I would definitely recommend booking. I love love loooove Dishoom! My parents are both from Bombay originally and they both rate it which definitely validates it authenticity! I too love their attention to detail with the décor, it really takes you back in time. If you like seafood you have to try the Koli prawns next time!